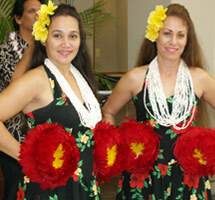 Along with hula dancers, visitors and residents will now be greeted in the Hawaiian language. Photo courtesy of Hawaii Dept. of Transportation. Visitors and residents alike will now be welcomed by a Hawaiian language greeting at the Molokai Airport. The Hawaiian Language Greeting Program was launched at Honolulu International Airport in February. Launched earlier this month, the greeting at Molokai Airport is a part of the Hawaiian Tourism Authority’s statewide Hawaiian Language Airport Greeting Program to integrate the Hawaiian language into the visitor experience. Hilo, Kona, Maui and Kauai International Airports are expected to launch greetings in the coming months. Local residents from each island will record the messages for their respective airport. E na makamaka kipa mai i ke Kahua Mokulele O Molokai, o ka heke o ke aloha ia oukou! E na hoa e haalele ana, mahalo keia kipa ana i ka aina hanau o Hina. No na kamaaina no hoi, e hele a hoi palekana mai no. A ia oukou e malihini me na kupa aina pu i hoea mai nei, ke aloha o nei aina ia oukou a pau! Welcome to Molokai Airport. To our departing kamaaina, travel safely and come back soon. If you’ve just returned, welcome home. And to our visitors, we hope you enjoy your stay and come back to visit again. Ke aloha! To hear the airport greeting, click here .